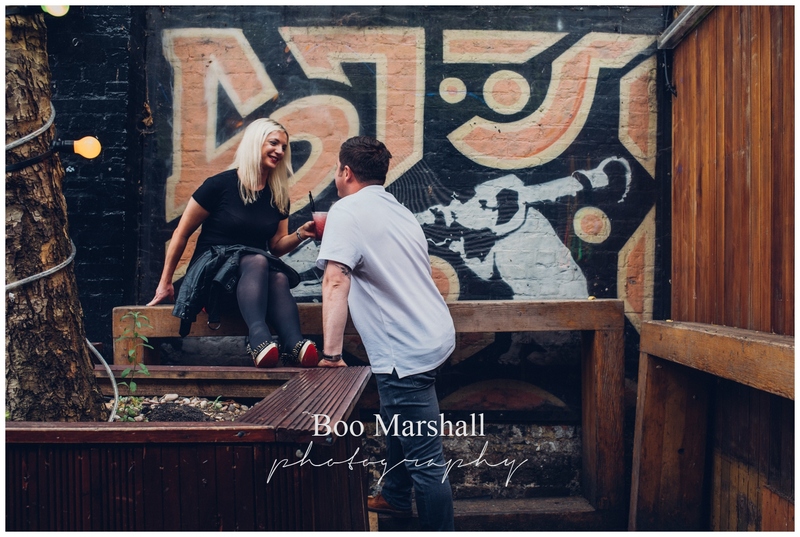 Back in July, the 8th to be precise, (because that was my birthday), I had an engagement shoot unlike any I’d done before. 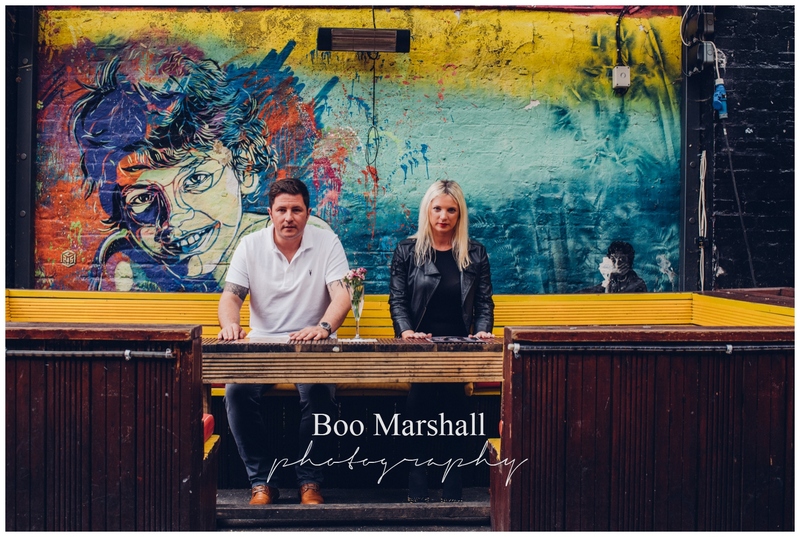 Michelle & Ryan had specifically requested a street art pre wed shoot at Cargo, Rivington Street – where not one, but two Banksy’s can be seen. 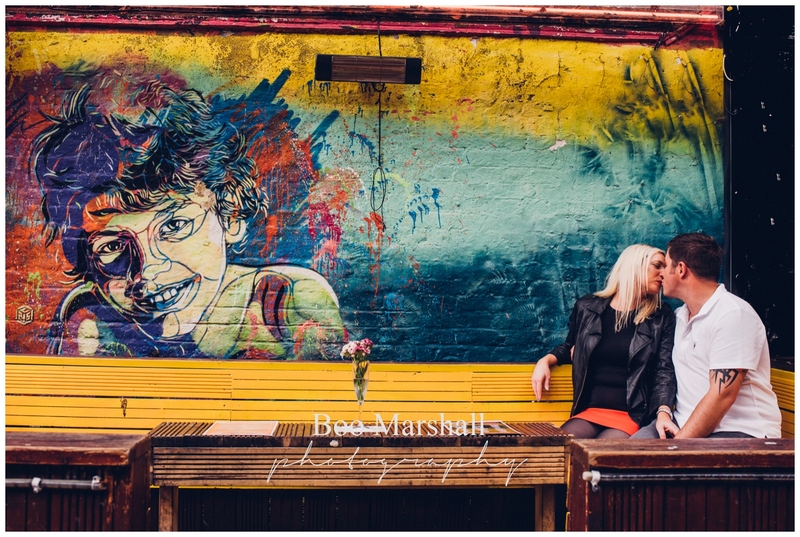 Not only that, but Rivington Street is an explosion of colour, a real assault on the visual senses. One creative talent after another shouts for attention in this tiny back street on the borders of the bustle and wealth of the City of London. So of course it made absolute sense for Michelle to arrive, not just with Ryan, but with iconic shoes from Christian Laboutin no less! 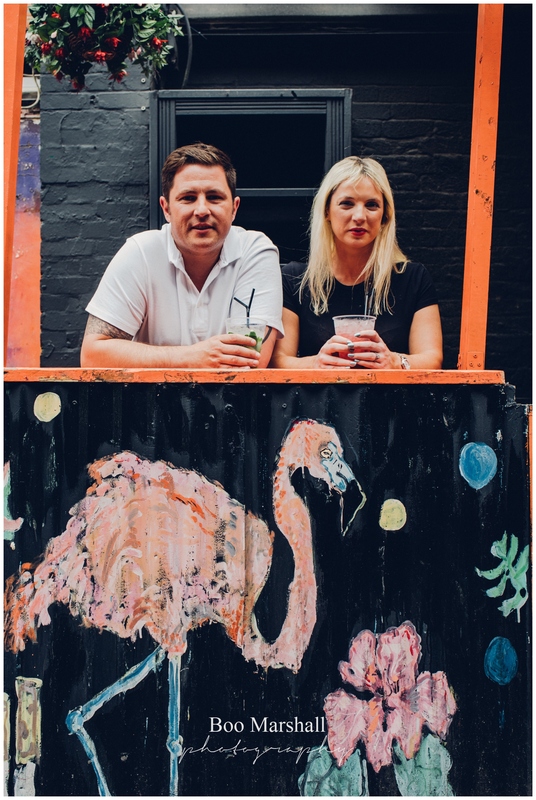 We’d arranged to meet at Cargo, the nightclub where so many of these immediately recognisable pieces of art are located. The manager was fantastic and kindly let the couple have the run of the courtyard. And because we’d arrived so early in the day, we had the place to ourselves. Apart from a builder’s van which inconveniently decided to park right in front of the gates! 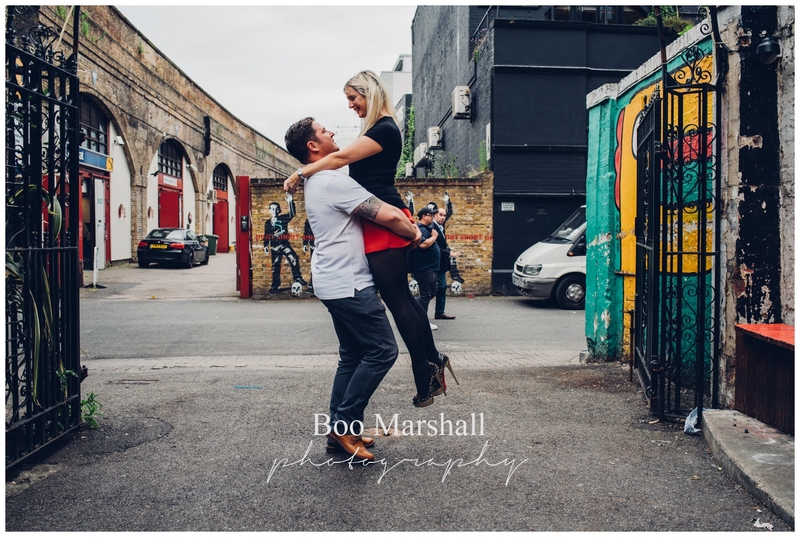 Finally we found the driver who moved the van and the pre wed shoot could begin! It didn’t take long before we caught the attention of surrounding office buildings; soon crowds of faces could be seen pressed up against windows looking down. 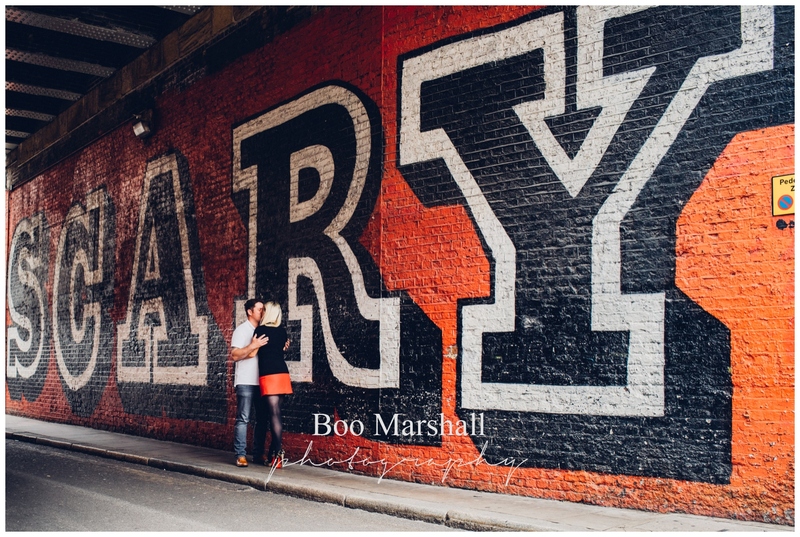 I wasn’t sure if it was the couple, the shoes or the shoot itself that was creating all the interest! 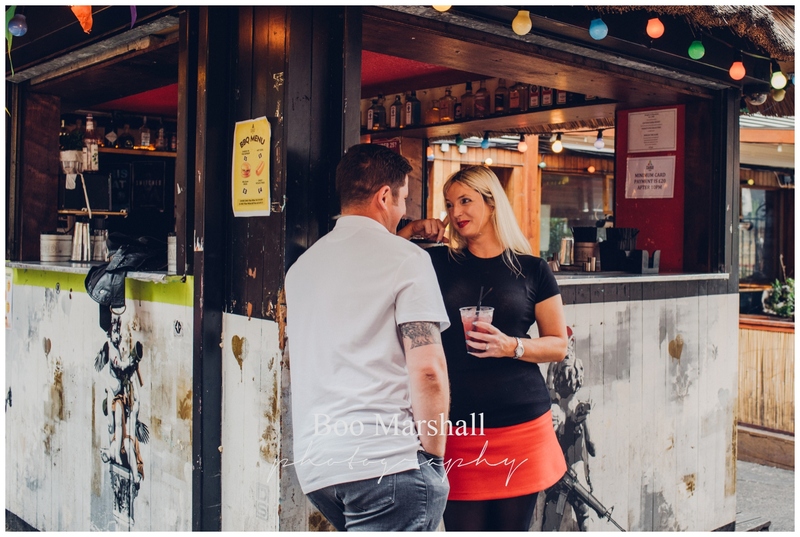 An engagement shoot is a time where I get to know the couple, and they me – and more importantly, they lose their inhibitions in front of the camera and learn how to relax and just be themselves. 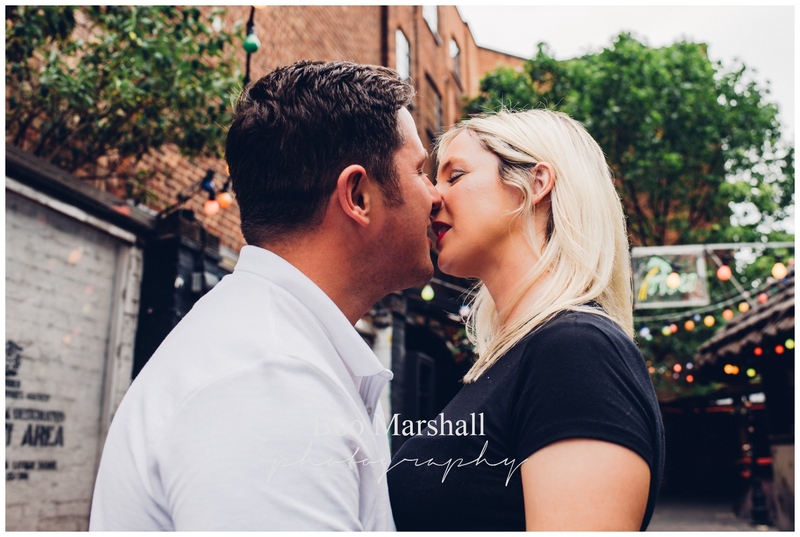 Seeing Michelle and Ryan together, in this amazing tiny location in London, I could see why they had chosen it. 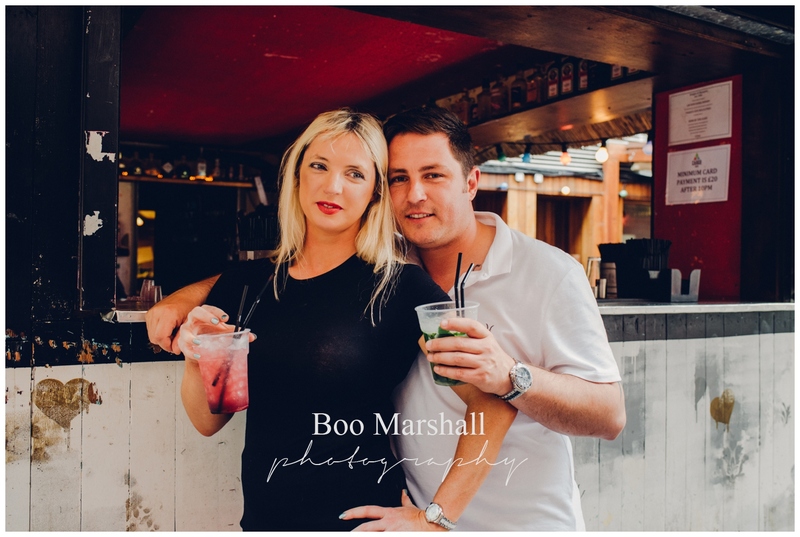 The theme they had planned for their wedding was a festival theme; for them, colour, being outdoors, letting their hair down, having fun was a big thing. Not for these two an enclosed art gallery- but a street where artists rebelled against closed doors and interior walls. 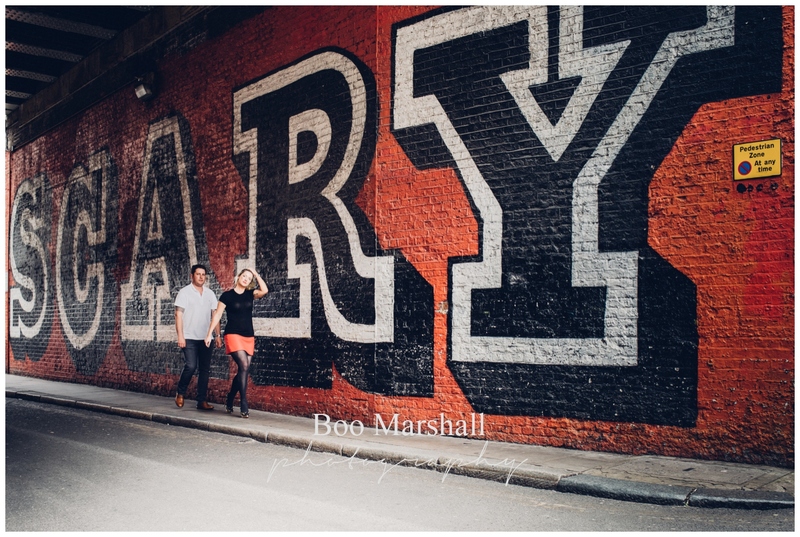 However, with all the artists vying for attention in this street art pre wed shoot at Cargo, my favourite for this couple was the Ben Eine ‘Scary’ piece. 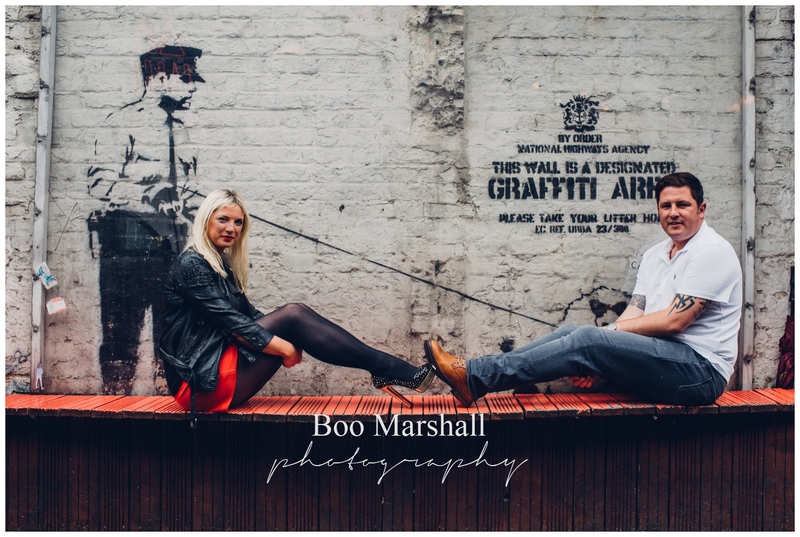 In fact, the pictures with this street art are still amongst some of my favourites ever taken on any engagement pre wed shoot! 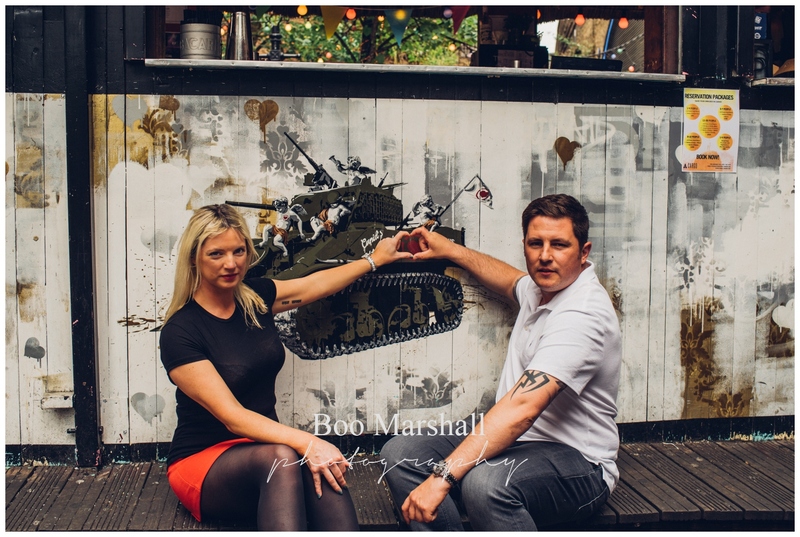 If you have a great idea for an engagement shoot, do get in touch. 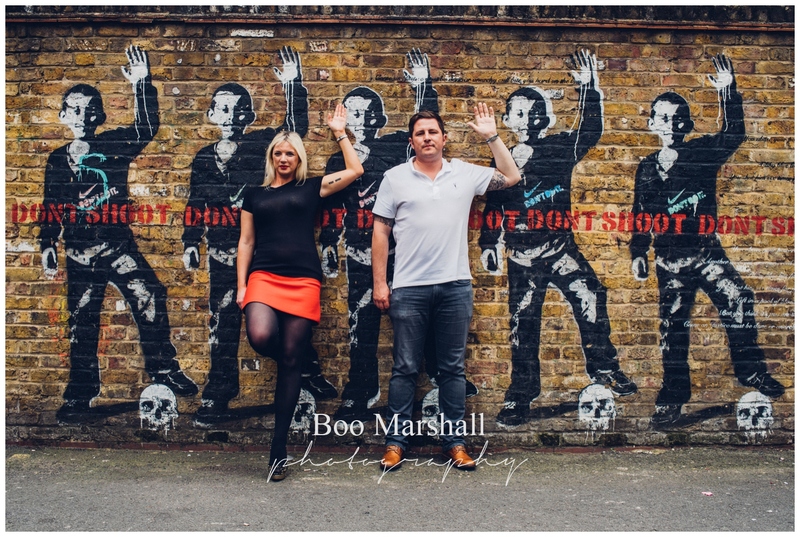 They are included in my top wedding photography package, or can be commissioned separately. This is a Sisterhood Stories blog post. 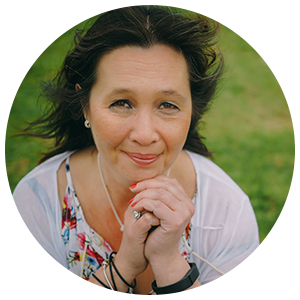 Please click on the button at the bottom of the pictures to go to the next blog in our circle! 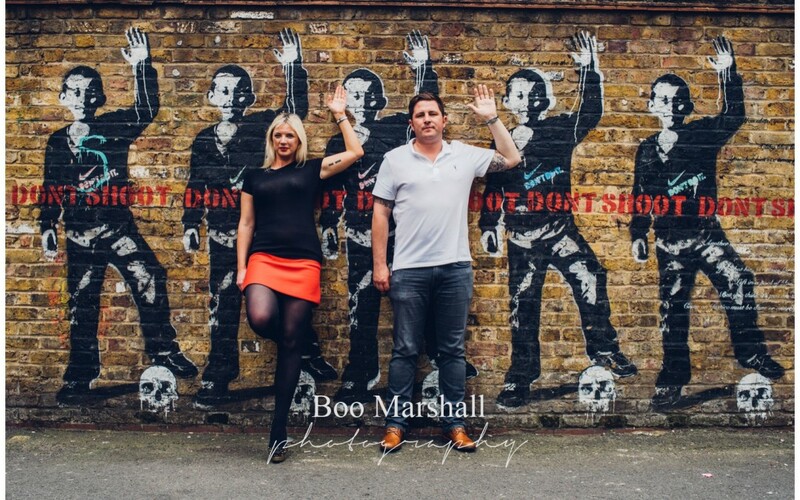 What a fantastic venue with two banksy’s and such fab shoes! 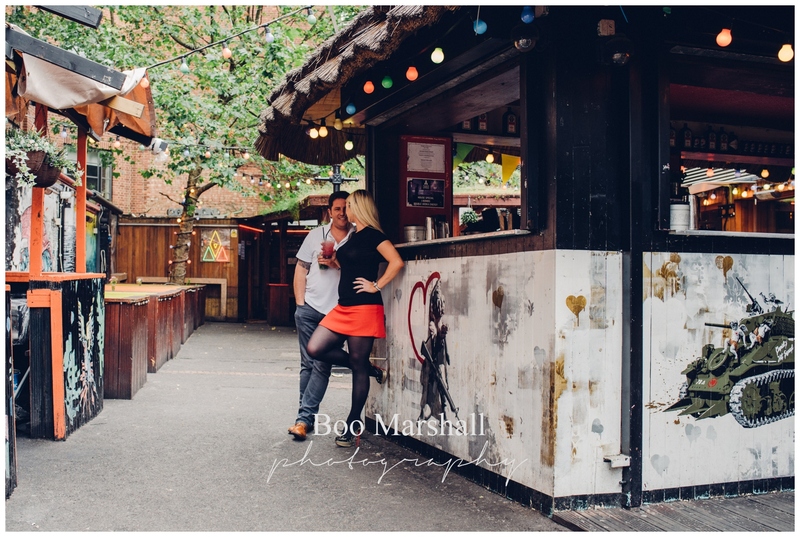 What a fantastic pre-engagement shoot for the guys. Excellent photos as always. 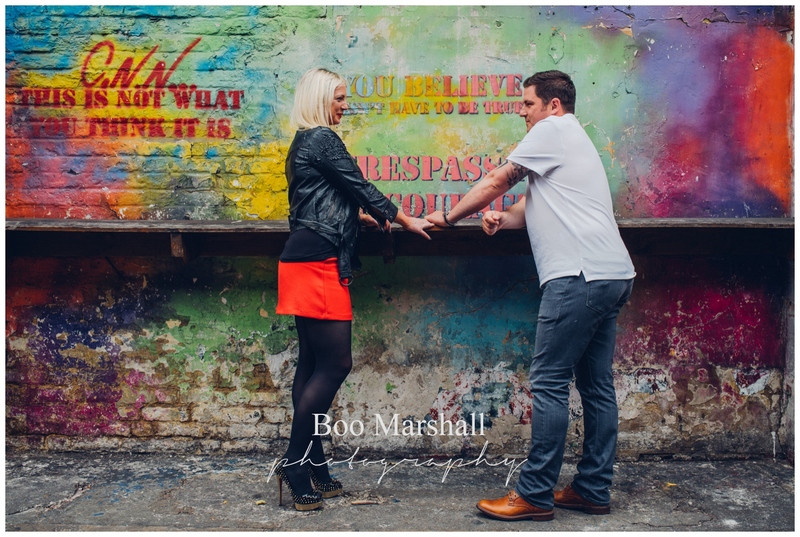 Love the vibrance of the colour in this, so nice to see an explosion of colour in a pre-wed shoot!